Karla is a very popular face painter for birthday parties and events. Along side Andy, children's entertainer and magician you can have our face painting included in the package and guarantee a stress-free and fun-packed party or event. Booking Face Painting with Karla is an excellent way to attract people and entertain the children. 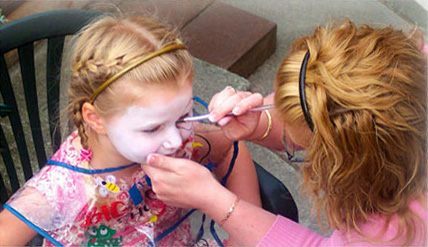 By booking face painting with Faces by Karla, you will be getting an excellent face painter and children's Entertainer, who is fully insured and reliable with competitive prices. All the face paints we use are FDA and EEC approved. As a face painter, Karla is available 7 days a week, covering Birmingham, Wolverhampton, West Midlands, Worcester and all surrounding areas, and can adapt to any situation, whether it's a corporate function or Christening, from a birthday party to a school fete, Karla will brighten up the day as well as the children's faces, and Karla is always there to help make your event a success. Combine Karla's face painting with, children's party entertainer and magician, Andy and his two-hour party package and you really will have a stress-free party. As a magician and children's party entertainer, Andy has 21 years of expertise and knowledge and will entertain the kids and one at time he will send the children over to Karla who will transform their faces. No queuing, no arguing over who's next, just happy, happy children - well for two-hours at least.